If there is a better on line dictionary than that of the Real Academia Española I would be very surprised. For years I have suffered dictionary laziness. If there is a word in a novel that I do not understand I tend to not want to get up from my bed to look it up. I have solved part of the problem by having and Canadian Oxford Dictionary by my bedside table. Spanish has been more of a problem because my Spanish dictionaries are ancient. It was some 8 years ago on a trip to Buenos Aires that the local newspaper, La Nación, had an article on the on line dictionary of the Real Academia. It would seem that this hallowed and ultra conservative organization, an apologist for the language of Miguel de Cervantes Saavedra, had decided to modernize. Consider that they nominated the swashbuckler Cartagena born author Arturo Perez-Reverte to the academy. I can boast that my grandfather Don Tirso de Irureta Goyena was younger when he was nominated. The fact is that this dictionary is very efficient and easy to use. I am delighted with it and use it often. 1. m. Fritada de pimientos, tomates, huevo, cebolla o de otros alimentos, picados y revueltos. 2. m. Jugo o sustancia que se obtiene de la carne de ave, y se da caliente al enfermo que solo puede tragar líquidos. 3. m. Mezcla confusa de diversas cosas en un discurso o en un escrito. It has then taken me 66 years to find out that pisto is Spanish for hash or hashing. Machacar (Latin pistus) is to chop up. I have always associated pisto not only with my mother but with my father who taught me that a tomato fried at very high heat goes through a chemical change (the sugar) and it acquires a wonderful taste. They almost have to be burned for me! Another dish related to the tomato is a salad that my mother made with tomatoes, hard-boiled eggs and sliced onion. She said it was a favourite of Don Tirso. To this salad she simply added oil and vinegar. Rosemary loves the salad. We serve it with meat or chicken and its colour acts as a foil to plain white rice or kanin as they call it in the Philippines. 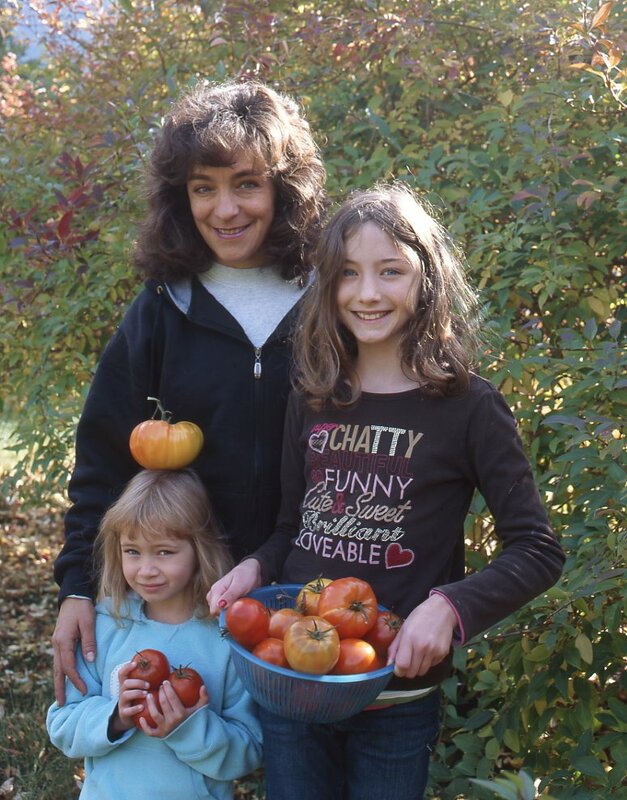 In Lillooet last week Ale told us that we had to pick the last of the tomatoes from her garden even if they were not ripe. The frost was coming. One of the tomatoes was very large and Lauren said it reminded her of a pumpkin. Thirty years ago when I taught high school in Mexico City my students would bait me often with my opinion on drugs. I realized that if I was catagorically negative about drugs in the usual manner the ears of my students would flap shut in class. I always told them that my approach to drugs was the same as to the tomato. If I purchased a super market tomato I might want to add lots of pepper and even MSG if the tomato would satisfy my taste buds. But the route to take with a vine-ripened tomato was to pick it with one hand while holding a little salt shaker with the other. The tomato was good enough. The taste would be exquisite without any addition of spices or enhancing MSG. 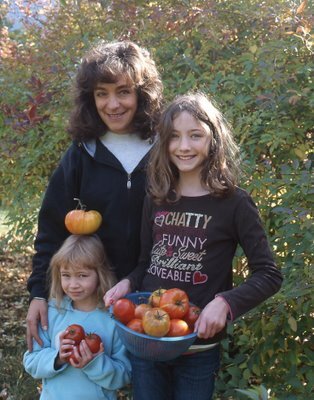 To me life was like a vine-ripened tomato. Some understood what I was getting at and would not push further. It was brisk but not cold last weekend at Ale's in Lillooet. She was getting ready for winter. 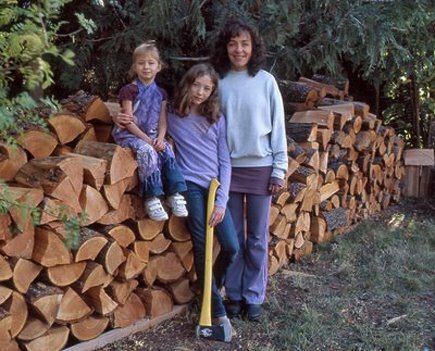 Her house does have central heating but she rarely uses it as her wood stove in her living room is most efficient. She has to keep it fed. So the folks who seem to supply most in Lillooet with nicely chopped firewood arrived and unloaded three pick-up loads. We found ourselves piling wood. This is something I have mostly never done before. I got slivers and sticky resin but the work made my blood circulate. We built three piles, one of them in Ale's inside porch. Being her father I gave her advice. I am sure she knows better. I told her that she should leave the indoor pile intact, brave the early winter and go outside to get her firewood. Sometime around 1964 I had a professor at the University of the Americas who looked like Robert Frost (he had lots of white hair). They had been friends. He had many stories to tell us. From the back row where I sat, these stories, then, were drones that went in one ear and out the other. But somehow some stuff managed to linger and then remain. One day he read us Robert Frost's Wood Pile. It took all this time and making a wood-pile in Lillooet to finally connect. Watching Leslie Howard and the dazzling Merle Oberon in Harold Young's (1935) The Scarlet Pimpernel with Rosemary this afternoon did little to dissipate my depression a day after teaching my editorial class at Van Arts. How can one teach such a course with the reality that editorial photography is moribund? Half in jest I would even suggest that it is far harder to find an editorial job these days than for Raymond Massey's Citizen Chauvelin to find that cursed and elusive Pimpernel. Looking at all of Leslie Howard's disguises to thwart the evil Citizen Chauvein I thought of an assignment for Vancouver Magazine in 1996 that gave me lots of pleasure and did involve a woman with an illusive and complicated personality. She was not one but four women. Pamela Swanigan a journalist and staffer for Vancouver Magazine came up with the idea of putting four different descriptions of herself in the personals of a local Vancouver newspaper. The responses were astounding and varied. She wrote of her experience for Vancouver Magazine and art director Anna Belluz hired me to photograph Swanigan in her four different descriptions. While Belluz was pretty serious and always at what seemed to be the proximity of a nervous breakdown she did give me the chance to have some fun. 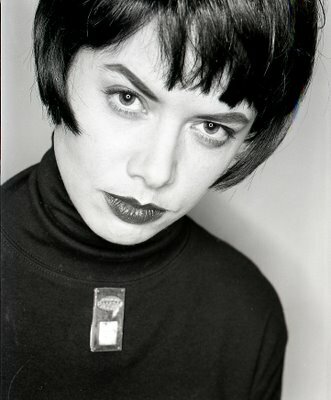 I immediately asked her to hire stylist and makeup artist Gitte Axen. Axen worked for movies so she accepted the assignment (and the obvious low editorial rate) simply because she knew we would enjoy ourselves. This we did. Active Me: SF, early 30s, likes board games, long walks, good conversation, watching sports. Musical tastes from ABBA to Chaka Khan. Lowbrow film tastes. Reads Harlequin Romances, Derek Wakcott, T.S. Eliot, children's lit. Seeks kind affectionate, articulate man, 25-40. Basic Me: Pretty SF, ND.NS, 32. White/black/native ex-californian, extremely smart, direct, curious, passionate; caustic sense of humour. Financially and emotionally stable. 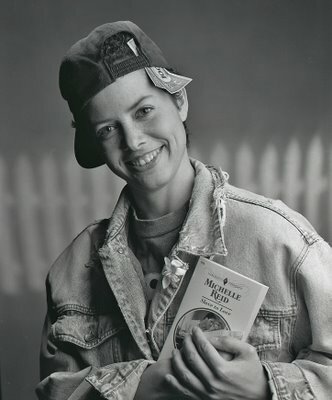 Seeks intelligent, introspective, loving man, 25-40. I haven't heard of or seen Swanigan since 1998. I wonder if she ever found a man and which one of her was the one that did it? Would the moribund magazines of today consider such crazy and fun ideas? Modern dancer and choreographer Crystal Pite has that kind of elegance and class that cannot be explained or defined. When I photographed her a couple of months back for three grueling hours in my very hot studio both of us were exhausted. She looked it. Sometime around the end I made her stand by the wall and I lit her with my very old Hollywood scoop light. This picture did not make the final cull of the ones that appeared a couple of months ago in VLM. But it still remains one of my favourites as it dipslays her poise even in the worst of conditions. As I looked at this picture today I thought of someone who also had elegance and class. He was my friend Harvey Southam who died by his own hand in Toronto in 1991. His method for leaving us was not elegant nor was it bloody. For the first time since I knew him he lost a bit of that elegance but gained a tad in originality. Southam was the only rich man who could drive a Buick station wagon (when most in his league drove BMWs) and still make that Buick look good. He looked good no matter what the car was. We once took a helicopter to Victoria so that I could photograph and he could interview the then leader of the NDP. Bob Skelly. My equipment was specially heavy but he carried it for me. After the successful shoot and interview I told him, "Harvey I want to invite you for high tea at the Empress so that someday I can say that this poor freelancer invited you for tea." He smiled and went along with the charade. We had a great time. There was a memorial service for him at Christ Church Cathedral a few months after his death. I hate memorial services so I decided I was not going to go. The night before I thought about it. I changed my mind. I went to the service and sat as far back as I could. My head was leaning against the back wall of the church. The minister talked about idyllic summers in Qualicum Beach. I looked around and I did not see one single person of colour. I had come because that night before I had begun to understand that Harvey Southam's passing and his memorial service in Vancouver would one day be seen by historians as a day when the old guard of Vancouver changed to a new one. It would define the end of an era and the beginning of a new one. By being in that church I would observe the changing of the guard. The idyllic summer days in Qualicum would end and be replaced by quick weekend trips to LA or Hong Kong. A few years before I had accompanied Southam to one of the Bentall towers. A group of eminent Vancouver businessmen were siting at a very large table. Southam sat down. One of them said, "Who are we going to pick as chancellor for Simon Fraser University?" A few weeks before I had been invited for dinner at a new Chinese restaurant by city Alderman and deputy mayor (they were known as that then) Bill Yee. I remember that I was sitting right next to City Engineer Fritz Bowers. I felt I was getting an inside look at power in Vancouver. The next day when I showed up at Southam's office (he was the editor of the city business magazine Equity which he had founded) I told him of my experience with Bill Yee and made the comment, "Yee could make our city's first ethnic mayor." Southam looked at me and with a gentle smile said, "Not while we're around." On another occasion we had gone to Whistler to photograph Vancouver Stock Market honcho Peter Brown. Brown had purchased a restaurant and Southam was writing about it for Equity. We went in his old Mercedes (the one before the Buick) two seater sportscar (the one with the boxy square roof). One of the headlights was not working. On our way back we gorged on a large bag of chocolate-covered expresso beans that Southam had purchased. The combination of the chocolate, the caffeine and the one headlight made our trip back a scary one. Two weeks before Southam died I was in Toronto to see magazine art directors. On a Friday, late afternoon, I decided to call his office. Southam answered. I was surprised. "Can't you hire someone else to answer your phone?, "I asked him. "Hey," he answered, "I do everything here and that includes answering my own phone." That evening I stopped by his office and we went to a nearby cafe where he had a coke and I had a coffee. He was still that elegant and classy guy I had known a worked with for a few years. I sensed in him that warmth that I had always admired in him. I can't but think that while something of Vancouver died with Harvey Southam that afternoon at Christ Church Cathedral in 1992, our fair city in spite of its growth and "world-class" beauty may have lost some class and elegance that has yet to be renewed. I can neither explain nor define the loss. Every time we drive to Lillooet and back it is impossible to not notice the hundreds of thousands of pine trees that are dead or dying (the pine beetle, Dendroctonus ponderosae) between Lillooet and Lytton. What makes the trees that more obvious is their beautiful bark made up of rough, rich reddish brown plates with wide dark brown or black grooves. 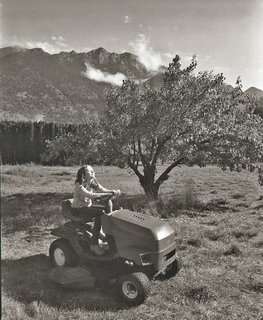 This last Sunday I decided to stop and photograph Rebecca with my Noblex panoramic camera which shoots a 7 inch long negative. It is most unfortunate that this blog will not show pictures that are longer than 5 inches but if you click on the image it will get larger. Before we left we pulled a bunch of needles so we could indentify the pine with our books at home. 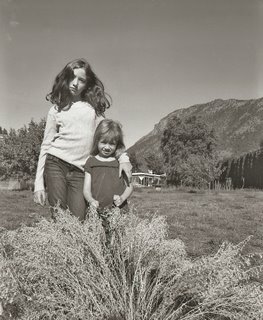 We called our daughter Ale in Lillooet that evening and she told us the pines were Pinus contorta (Lodge Pine and Lodgepole Pine). She could not confirm it to us as she had never stopped to check on the needles but this is what the city sages had told her. My wife Rosemary knew differently. Both of us had met the gentle and erudite Gerald Bane Straley (he died in 1997) who was the Research Scientist and Curator of Collections at the UBC Botanical Garden. I had even taken a course on propagation with him and found his enthusiasm catching. Rosemary had been taught by Straley that the only definitive way of identifying a pine tree was to count how many needles grew from one bunch. 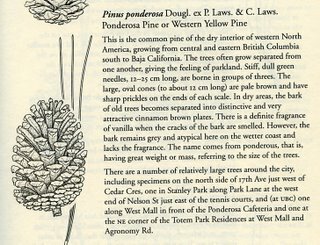 A Pinus contorta has only two needles per bunch and the pines between Lillooet and Lytton had three. Our books showed the telltale bark but said nothing of the needles. But then I remembered Straley's book. It is one of the most useful books in our botanical book collection (a splendid thing to say in an age of looking up stuff on Google). 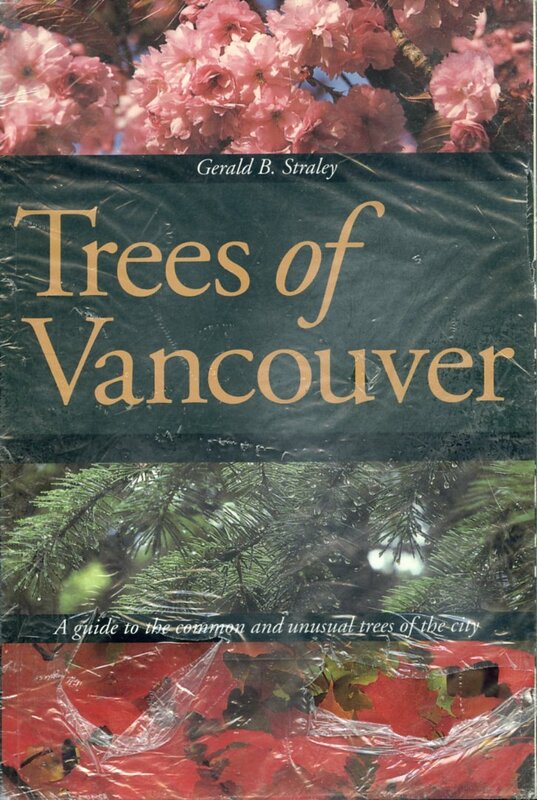 It is called Trees of Vancouver - A Guide to the Common and Unusual Trees of the City. On the conifer section he confirmed (the three needles) what Rosemary has suspected. Our beautiful dying pines were and are Pinus ponderosa. This book, which should still be in print is one of the finest books to be had. 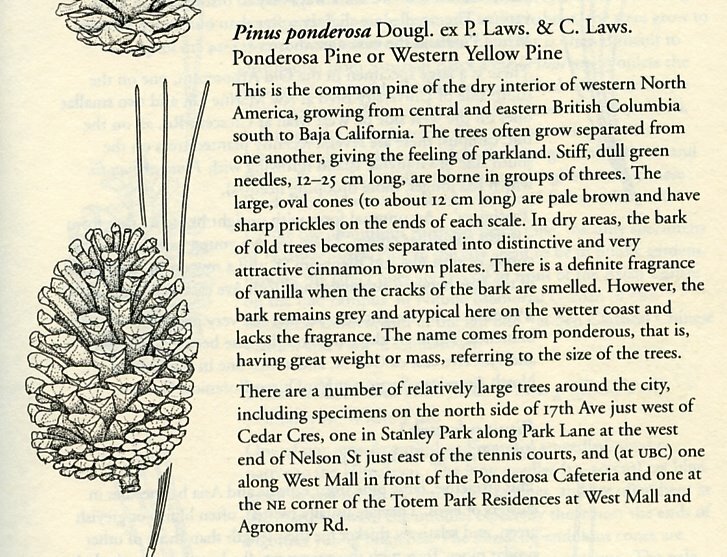 The diagram and explanation of every tree in the Shaughnessy Crescent is worth the price of the book. Best of all every varity of tree in our city is given a location within Vancouver where one can find a good specimen. 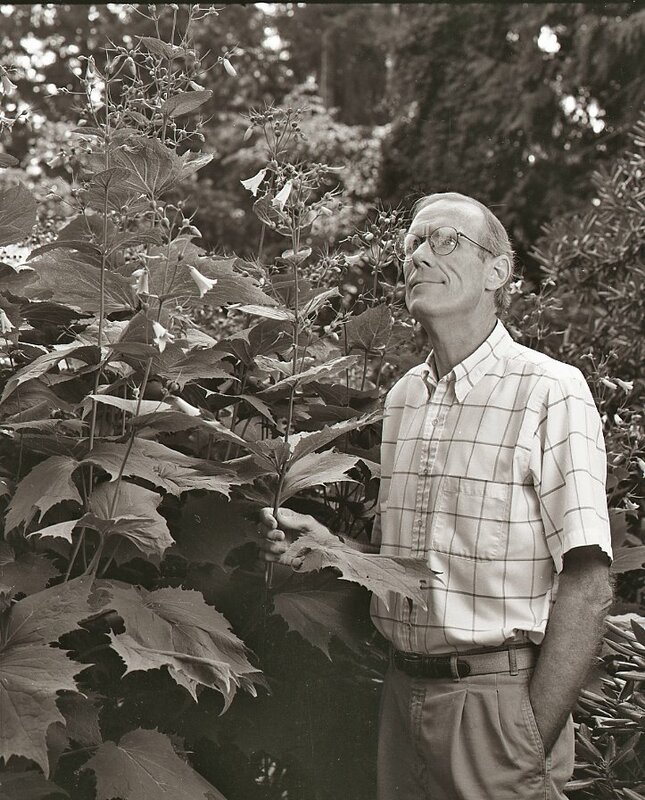 When I photographed Dr. Straley at the UBC Botanical Garden and Centre of Plant Research (that's the new name of the garden) I asked him what was his favourite plant at the time. It was Kirengeshoma koreana. There is a definite fragrance of vanilla when the cracks of the bark are smelled...the name comes from ponderous, that is, having great weight or mass, referring to the size of the trees. A constant theme here has been my harping on the wonders and benefits of routine. In particular it is an association of routine with custom and tradition. 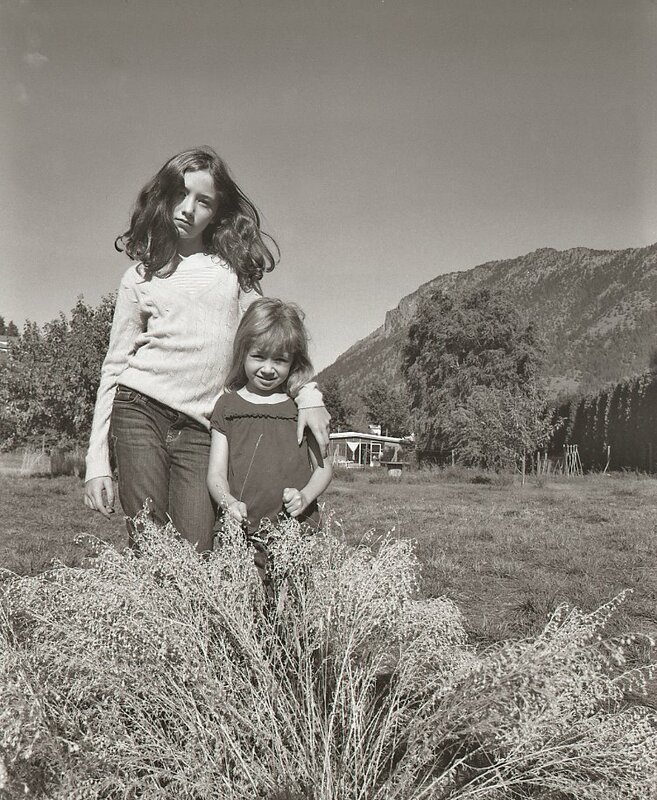 My wife Rosemary is a creature of routine as are both my granddaughters Rebecca and Lauren. 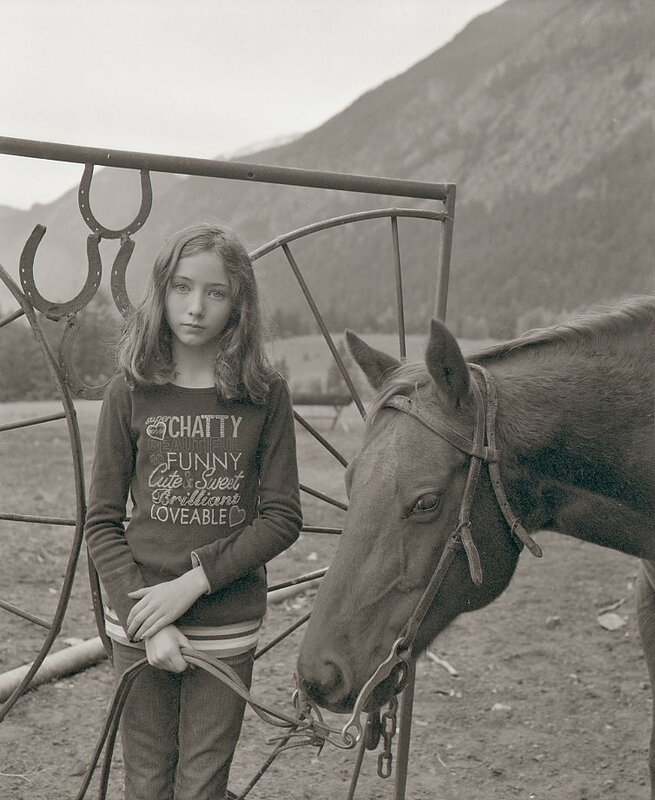 It is never more evident than when we go to visit Ale in Lillooet. The girls expect my home made pizza in the car by the time we get to Chilliwack on our way North. They expect to be exposed to new music on the CD player yet Rebecca wants some of the oldies such as Oscar Peterson playing the Work Song. Of late I have been thwarted by oposing routines to my peril. When I print a b+w negative in my darkroom the emulsion (the matte side of the negative) is always facing down. When I scan that same negative the emulsion has to be facing up. Over the weekend I took some photos of Leo the horse to his owner Lloyd McNary. It was too late to re print them when I noticed I had printed them backwards. Luckily McNary did not notice. Routine in a darkroom is important. When the lights are out I instinctively know where everything is and when I go to grab this or that I find it. The opposite of this routine is similar to working on someone else's computer and navigating with an alien mouse! Sometime around 1965 I was visiting my first cousin Inesita O'Reilly Kuker in her home in San Isidro and she instructed me to buy her some sliced ham at the local almacén. I asked the man behind the counter for 350 gramos de jamon cocido (cooked ham). At that point the man began to shout at me, "I have mortadella, prosciutto, many varieties of cheese and you dare to ask me for sliced cooked ham?" He shouted and almost went beserk. I turned tail. My guess is that he was finally done in by customers' routine. I have a fondness for listening to live performances of Vivaldi's Gloria and part of my routine is to bring along a stop watch to record the variation in length. It would seem that my love for routine sometimes involves a variation of it. Going to visit Ale is all routine. That routine was broken by bringing The Flight of the Red Balloon. This is an art film that is as slow as watching red paint dry. An 8 minute long one camera take may delight a film aficionado but it did not delight anybody even though I had fallen for the review of the film in the NY Times which was glowing. Another routine, the taking of a photograph in the same place, but months or years later brought tears to Rebecca's eyes who flatly refused to pose by Lloyd McNary's gate. Ale stressed the idea that I was trying to record how time changes things and people so Rebecca reluctantly posed with Sunny. The little girl that faced my camera in the spring seems to be an entirely different one that posed for me on Saturday. Another routine that was modified to the better was that I was less critical with Ale on her rustic living and I did my best to praise the relief we feel in spending a couple of days "en el campo" as Argentines say. 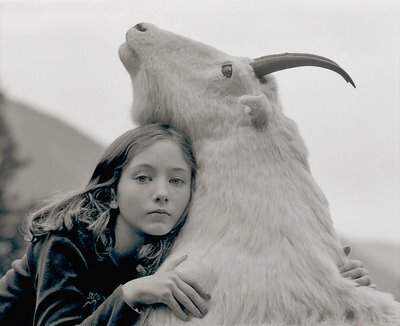 But I think that what is best about routine is the realization and sadness of knowing that all routines must end. It is part of the pleasure to savour them as if each time were their last. A nicely printed photograph of actress Liv Ullmann leans against the wall in my Robson Street studio. It has been there for at least 10 years. Fewer and fewer people who come to my studio notice her haunting face and fewer and fewer ever ask me who she is. When they do I like to throw the rather useless facts about her that she is not the most famous Swedish actress because she is known as a Norwegian even though she was born in Tokyo in 1938. My grandmother never suffered fools and when someone uttered a folly in her presence she would tell me later, "La ignorancia es atrevida." Her Spanish origin "Ignorance is daring." is a much more damning version of "ignorance is bliss". When people really did make fools of themselves she brought up an expression which showed the Darwinian conflict the Spaniards had with Darwin in late 19th century Spain. "Asomó el rabo," she would say. It was equivalent to, "he showed his monkey tail". I remember two particular daring and completely stupid utterances of mine that make me blush in shame every time I think about them. Sometime around 1964 I had a cultured friend with whom I went to concerts of all kinds. He was particularly keen on Ella Fitzgerald. One day he asked me, "Have you heard Carmina Burana?" He was extremely kind to me when I answered, "No, who's she?" At an American high school in Mexico City where I taught around 1969 I had some interesting teen age students who one day asked me, "Mr Hayward, have you heard any Alice Cooper?" They all roared when I asked, "No, who's she?" As a little boy in Buenos Aires we were all read in class the novel Corazón by Edmundo de Amicis. Until quite recently there was nothing about this Italian author in libraries or on the web. In most cases he has been forgotten as was the author (I have no idea who it was) of a biography in Spanish of Franz Schubert that our fifth grade teacher used to read to us every day. For me, memory is much like a red carpet that is being rolled out at the same time that its opposite end is being rolled up. As we gain more facts our brains stores memories of our past into cubbyholes that sometimes are just about impossible to access later. Unlike computers we cannot buy more RAM. I think that this unrolling and unrolling happens with history, literature, music and just about everything else. John Gunther's Inside books were common knowledge and popular when I was a teenager. He has faded even more than my mother's favourite (and mine) spy novelist Eric Ambler. 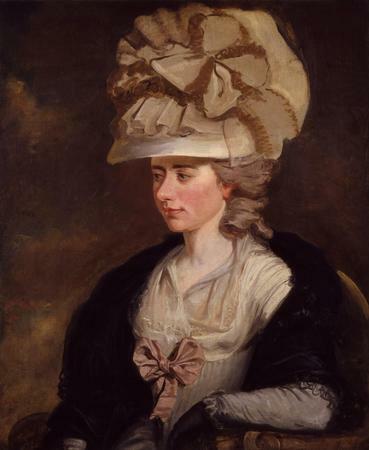 All those films based on Jane Austen or with Jane Austen as a protagonist have done nothing to revive much interest in one of her remarkable earlier contemporaries, Fanny Burney (below,left) who inspired Austen to write. I have a student in a photography class, the history of photography, whose last name is Kertész. I found it odd that my student had never heard of the famous Hungarian photographer, André Kertész who was one of the early founders of photojournalism. I have another student, very tall with a profile that rivals Barbra Streisand. On the day that I pointed out her resemblance she had a tall hairdo much like Streisand's in Funny Girl. My student has no knowledge of Streisand. It does make my class easier to teach. Much of what I tell them is absolutely new. A few years back (8, perhaps) I was driving my car while listening to a wonderful solo piano on CBC radio. I stopped and waited to find out what it was. It was Beethoven's Bagatelle for piano in A minor ('Für Elise'), WoO 59. I had to call someone to tell them of my experience. I dialed my friend and VSO pianist Linda Lee Thomas. 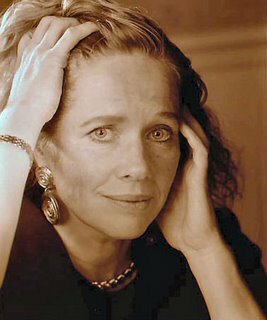 Her husband Jon Washburn, the conductor of the Vancouver Chamber Choir answered. I unloaded my wonder on him. His remark is one I will never forget because of the sadness in his voice, "Oh, Alex, to hear something for the first time. I am so jealous." I propose to be less vitriolic and more patient with my students' spotty knowledge of that I would consider important. Perhaps I can enthuse them to the wonders of Kertesz and even(!) Barbara Streisand. I have softened up thanks to the book that seems to be currently consuming my waking hours, Julian Barnes's nothing to be frightened of. A few years ago I was at the Birmingham City Art Gallery. 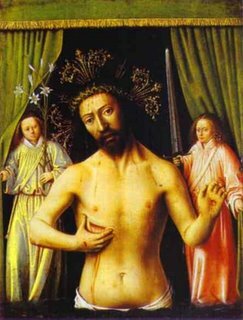 In one glassed-in corner, there is a small, intense painting by Petrus Christus, of Christ displaying his wounds: with outstreched forefinger and thumb he indicates where the spear went in - even invites us to measure the gash. His crown of thorns has sprouted into a gilt, spun-sugar halo of glory. Two saints, one with a lily and the other with a sword, attend him, drawing back the green velvet drapes of a strangely domestic proscenium.